The architecture, the decorations, the size of the room, the location on the cliff are all outstanding! The service that the staff offer on this property are out of this world. We were here for 6 days and each day was filled with magic. This is our last day and we are already planning to come back! Foods was absolutely fantastic, very light and healthy. Fine as well. The views exceeded my expectations, and the villa was amazing. They cleaned the villa twice a day. Perfect for couples! The location of the resort is spectacular. The food is really nice, and staff were all very nice. Architecture, location, service, food. All superb. honestly, this is one of the best hotels i've ever stayed at: the vila is stunning, the view/location is so picturesque, the service impeccable with so much attention to detail, the food amazing .. I can't say a single bad thing. Maya at the front desk went above and beyond to make sure our stay was memorable. Highly recommend it! Lock in a great price for Alila Villas Uluwatu – rated 9.4 by recent guests! 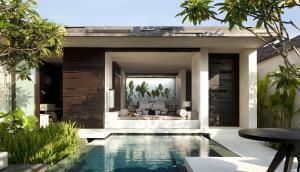 Alila Villas Uluwatu This rating is a reflection of how the property compares to the industry standard when it comes to price, facilities and services available. It's based on a self-evaluation by the property. Use this rating to help choose your stay! Boasting a 150 feet outdoor pool overlooking the Indian Ocean, Alila Villas Uluwatu is a 15-minute drive from Jimbaran Bay. Offering pool villas, it has a 24-hour gym and a spa. The modern Balinese-style villas boast an elevated outdoor pavilion overlooking the ocean. Each villa has an outdoor dining area and oversize bathroom. Amenities include a 32-inch flat screen TV and an espresso machine. Balinese and Indonesian specialties are prepared at The Warung restaurant’s open kitchen, while CIRE offers Western dining at 230 feet above sea level. Set atop cliffs along Bali’s southern coast, Alila Villas Uluwatu is 5.2 mi from Garuda Wisnu Kencana Cultural Park and 5.5 mi from the iconic Uluwatu Temple. The property is 11 mi from Ngurah Rai International Airport. When would you like to stay at Alila Villas Uluwatu? This villa comes with a private pool and cabana overlooking the Indian Ocean. Featuring Balinese elements in the decor, it has an open-plan living room, a 32-inch flat-screen TV, a DVD player and an espresso coffee machine. The large private bathroom has indoor/outdoor showers and premium Alila toiletries. This villa is perched atop a cliff-edge along the southern coast of Bali. It covers an expansive 21,528 ft² 32,292 ft² of space. Featuring a spacious lawn for private events or weddings, this villa also has a private 69 ft infinity pool. Walkways and bridges connect the relaxation pavilions and pools to the spacious living areas. Combining contemporary interiors with touches of traditional Balinese accents, this spacious two-bedroom villa features a private outdoor pool with walkways and a bridges that connect the pavilions and pools to the separate living and dining areas with open-plan design. Each of the air-conditioned bedroom has its own private bathroom featuring shower and bath facilities. Pura Luhur Uluwatu Pura Luhur Uluwatu (Uluwatu Temple) is Bali's most spectacular temple located high on a clifftop at the edge of a plateau 250 feet above the waves of the Indian Ocean. It is where the pilgrimage of Dang Hyang Nirartha came to an end as the High Priest shed his natural human form and achieved a conscious death nearest to the home of the God Baruna, Guardian of the Southern Seas. Bali National Golf Club Designed by Nelson Wright, the 18-hole course has a Championship rating of 73.2; a tournament rating of 71.7; a resort rating of 70.4; and a ladies’ rating of 70.1. Nick Faldo holds the course record – a marvellous 63 shot at the Alfred Dunhill Masters in November 1994. Beaches in Uluwatu Uluwatu is a very well-known destination among surfing enthusiasts. Explore white-sand beaches in Uluwatu, which many consider the best in Bali: Balangan beach, Dreamland beach, Padang Padang beach, Suluban beach and Nyang Nyang beach are all only 10 - 15 minutes away. House Rules Alila Villas Uluwatu takes special requests – add in the next step! Alila Villas Uluwatu accepts these cards and reserves the right to temporarily hold an amount prior to arrival. Please inform Alila Villas Uluwatu of your expected arrival time in advance. You can use the Special Requests box when booking, or contact the property directly using the contact details in your confirmation. The breakfast is the only thing we didn’t like.. No varieties and not the best quality. Would be better it’s a buffet with international cuisine. The villa is big and modern furnished.. All amenities needed were available and with good quality .. The staff are very helpful.. The Butler is very kind.. The villa comes with neutral colors and all staff wearing white, everything is very simple which gives a feeling of extreme peace and serenity. The massage is amazing. Don’t miss purchasing their signature spa products!! No hot water at night. Real insect problem not seen before in any Bali hotel. There many insects and sometimes they come in to the room. We stayed in a One bedroom with a private room with a partial sea view. The room and the services were great. It is a relaxing place and we didn’t go anywhere and stayed in the hotel for 4 days. Our expectations were exceeded in all areas. There is nothing that we didn’t like. Alila Villas was impeccable. Our stay was pure indulgence and relaxation. Luxury beyond your dreams. Beautiful architecture all around the resort. Spectacular views over the ocean. Excellent customer service every step of the way. Kind and happy staff taking care of your personal wishes and well-being. Lot of love and thought paid on food and wine from breakfast to dinner. Lovely private, hidden beach. Feels like time stops here for a moment. Experience you will never forget. The internet around the property even in the restaurants was a little waek. Great food and service. The dinner at Quia was very special. Alila is a magnificent hotel , stunning architecture, breathtaking views , fabulous food and very romantic! The 3 bedroom villa we stayed in was contemporary Balinese luxury , with its own 21 metre infinity pool,superb. Alila staff are fantastic and our butler Rai was the most professional and totally loves his job , a wonderful person . We are very well travelled and I will would highly recommend this beautiful hotel ! World class resort . Also next door to Omnia , the latest most cool cliff top bar in Bali . Had lunch at Sake No Hana , the Japanese restaurant, superb food and the views are magnificent! Loved our 4 nite stay .